A video shows the Revolutionary Guard Corps massing on a hill overlooking Jerusalem. A conference of religious scholars features speaker after speaker calling Israel's annihilation inevitable and promising that a "new phase" in that effort is about to begin. On Monday, Iranian Supreme Leader Ali Khamenei took to social media to attack the United States and Israel. 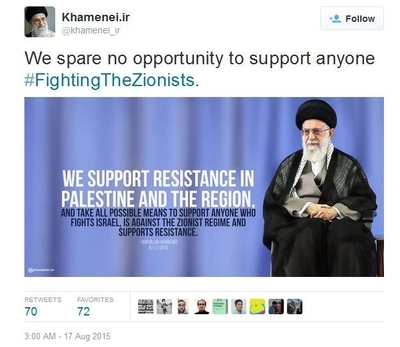 "We spare no opportunity to support anyone #FightingTheZionists," wrote the ayatollah, whose regime supplies Hizballah and Hamas with rockets and other weapons of terror. Perhaps more chilling is an animated video from the Islamic Revolution Design House, a media outfit associated with Iranian hardliners. It shows a soldier preparing for battle. He puts on a Revolutionary Guard patch, and then a Qassam Brigades headband, followed by a ski mask and a Palestinian scarf around his neck, while arming himself with a machine gun and a pistol. As he puts on a helmet, we see him looking over Jerusalem's Temple Mount, home of the Dome of the Rock and Al Aqsa mosque. The image pulls back, showing the soldier amid a sea of conquering troops. A concluding message invokes Ayatollah Khomeini's threat that Israel must be wiped off the map and promises that day is coming soon. A conference held in Beirut late last month reinforced that message over and over again. The General Assembly of Islamic Resistance Ulema (Scholars) held its first gathering under the banner "Unity for Palestine." The weekend meeting included fiery rhetoric from an Iranian ayatollah and Hizballah's leader Hassan Nasrallah. "Annihilation of the Zionist regime is a sure thing and Quranic pledge," Ayatollah Mohsen Araki told the assembly. Araki is secretary general of the World Forum for Proximity of Islamic Schools of Thought, emphasizing the importance of unifying "Muslims in countering the regime of Zionism and the arrogant World." Many of the speeches were uploaded to YouTube and translated by the Investigative Project on Terrorism. Nasrallah called Israel a "cancerous tumor" and said "It is only a matter of time" before it is defeated. "We believe with certainty that Israel, this cancerous tumor, is headed for extinction, and that Palestine and Jerusalem will be returned to their people. It is only a matter of time and [this outcome] is linked to the will, action, jihad, and sacrifices of the Ummah, according to the principle: If you achieve victory for Allah, Allah will lead you to achieve victory." Nasrallah said it was Allah's will for Muslims to achieve "final victory over the Zionist scheme" and urged the assembly not to waste the opportunity. "The day in which we will all pray in Jerusalem, Inshallah (God willing) is inevitably coming Inshallah. All of these calamities, conspiracies, and crises are merely trials to strengthen and make fit all those who believe in this project and in this path to enable them to be worthy of the coming victory. Some people may gain victory but then waste it. Allah Almighty wants our Ummah (nation) in its final victory over the Zionist project and in restoring Palestine and Jerusalem to be worthy of this huge historic victory and to be worthy of preserving this victory and not to lose it as many victories have been lost." Muhammad Hasan Zamani, a former Iranian cultural counselor in Egypt who runs the Department of International Islamic Madrasas for the General Assembly of Islamic Resistance Ulema, maintained the theme, insisting there is no peaceful resolution that would end in Iran's acceptance of a Jewish state. "Israel must be erased from the map of the world. These are the golden words Imam Khomeini (may God have mercy on him) uttered. Why do we assert the obligation of erasing Israel from the world, and not speak of erasing America and other unjust countries from the world? We in Iran say slogans in marches, Death to Israel, Death to America, Death to the English, and so forth and so on." Iran considers America the "greater Satan," Zamani went on to say, but the Islamic Republic respects other governments which were chosen by their people. By contrast, he claimed Israel is not legitimate: "I say that the example of the rule of the Zionists is the example of thieves who attack a house and occupy the house and the people of the house defend their house." Sheikh Abdel Halim Qadhi, a professor at Zahidan University, explained that the conflict is inherently about religion. "[T]he Holy Quran makes it know that Jews are the enemies of Islam and the Muslims, and their holy places and rites," he said. "Jihad is the most powerful and only way to liberate Palestine and defend Jerusalem," he added, saying "God loves those who fight in his way." In a final statement from conference attendees, the group emphasized "the first and most important obligation is to unite the Umma to liberate the holy Al-Aqsa Mosque" in Jerusalem, reported Al-Manar, a Lebanese news outlet considered close to Iran's proxy Hizballah. The group also said "resistance" was the way "to achieve victory in Lebanon and Palestine, despite the unlimited support received by the Zionist enemy and continuing inaction of the countries in the region." Meanwhile, Iran's supreme leader, Ayatollah Khamenei, published a 416-page book earlier this month outlining the destruction of Israel, referring to the Jewish state as an ally of "The American Great Satan." The book features a long-term strategy that entails terrorizing Israel in a war of attrition that would lead to Jews leaving Israel for other countries. Supporters of the nuclear deal say it's a fantasy to expect a better outcome should Congress override President Obama's expected veto of a vote to defeat the agreement. The combined statements of Iran and its supporting clerics makes clear, however, that the true fantasy is any expectation Iran will turn away from terror as a result of its engagement with world powers. If the Arabs would be so foolish as to send a sizable ground force into Israel or to rocket Ben Gurion Airport or any of Israel's heavily populated civilian areas, they should be aware of the consequences. I know Israel likes to play it close to the vest and not reveal what they are doing or plan to do in such a situation but anything and everything should be on the table. This includes the destruction of the Al Aqusa Mosque and the rebuilding of the holy temple, the retaking of a portion of historical Eretz Israel which the historical revisionists like to refer to as "The West Bank" and resettling the occupying Arab population to Jordan. In retaliation for the invasion, the cities of the countries participating in the attack on Israel including those supplying training and weapons would be fair targets as were the cities of Germany and Japan during WWII. All contingencies need to be considered when your survival is at risk.